The Memorial Candle Program has been designed to help offset the costs associated with the hosting this Tribute Website in perpetuity. Through the lighting of a memorial candle, your thoughtful gesture will be recorded in the Book of Memories and the proceeds will go directly towards helping ensure that the family and friends of Myrna Shrader can continue to memorialize, re-visit, interact with each other and enhance this tribute for future generations. Myrna Wright Shrader, 77, of Salem, went to be with the Lord on Sunday, March 11, 2018. Myrna was a lover of animals, riding in the car on long scenic drives, looking at nature, and creating beautiful flowerbeds, as well as a watching classic films and enjoying the pleasure of Hallmark’s creations. She was preceded in death by her parents, Andrew James Wright and Hallie Agnes Wright; husband, Howard Percy Shrader; and brothers, Charles F. Wright and Clyde Wright. 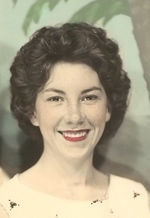 Left to cherish her memory are daughters, Debbie S. Alldredge and husband, Gary, and Rhonda S. Wise and husband, Gary; sister, Elsie W. Nicewonder and husband, Fred; grandchildren, Morgan L. Wise and Scott P. Wise; and numerous other family members. A period of visitation will be held from 6 until 8 p.m. on Wednesday, March 14, 2018 at John M. Oakey & Son Funeral Home, Salem. A funeral service will be held at 2 p.m. on Thursday, March 15, 2018 at the funeral home. An interment will follow at Old Dominion Memorial Gardens, Roanoke.